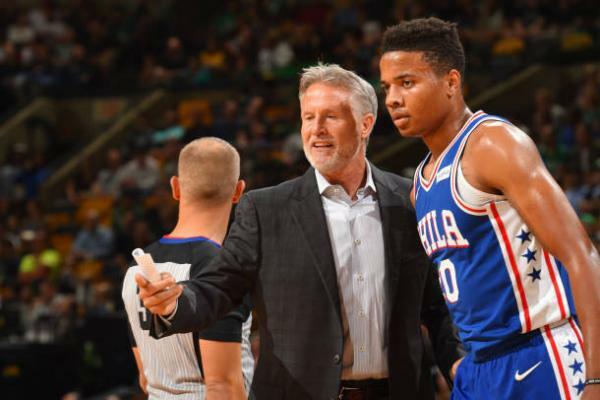 Plenty of people are worried about Markelle Fultz’s shoulder injury, which has, apparently, prompted him and the Philadelphia 76ers to tweak his shooting form. The result, through four games: 33 percent shooting from two-point range, no attempted threes and a 50 percent clip at the foul line. It would seem, then, as if profound concern is justified. But the Sixers aren’t stressing about it…for now. So, like, I’m no doctor, but if your 19-year-old cornerstone is injured…maybe don’t play him? The Sixers clearly wouldn’t put Fultz in harm’s way this early in the season just to chase what will end up being a low-seeded playoff berth. It’s fair to assume they aren’t jeopardizing his big-picture health. But his shooting form and confidence is a different story. Perhaps Fultz has it drilled into his mind that this start-of-career slump is behind him. And maybe he knows most NBA players slog through some pain every season. But it’s patently weird to see the Sixers throw him to wolves with a butchered shooting form and injured shoulder after they’ve treated Ben Simmons and Joel Embiid with kid gloves for so long. At some point, if Fultz’s shooting struggles persist and his shoulder isn’t getting any better, they have to ask: Is this really worth it? Or should they maybe shut him down until he’s physically right?